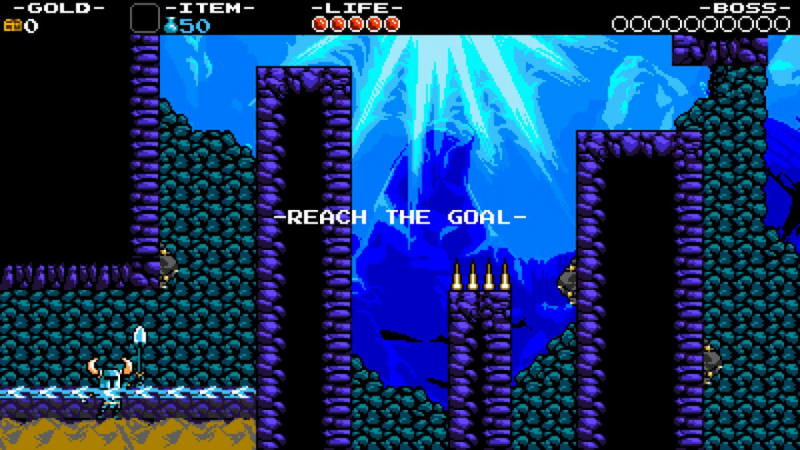 The new Shovel Knight expansion has finally dropped, and while it may not be an entirely new game in the Shovel Knight franchise it still brings enough new content and ideas that it warrants a sort-of-review. Remember, this expansion is entirely free with the game, we're just going to share our thoughts on it and how it differs from the main campaign. Plague of Shadows follows the adventure of Plague Knight, a fan favourite character who was one of Shovel Knight's foes in the original game. Each of the other members of the Order of No Quarter is in possession of an "essence" that's a crucial ingredient in the Ultimate Potion that he's trying to brew up. This provides a convenient excuse to run through all of the same levels and bosses again, but things are kept interesting by the witty dialogue and a subtle love story sub plot. It's particularly interesting to see how characters respond differently this time around, such as how a guard won't let Plague Knight into the village due to his infamous reputation. 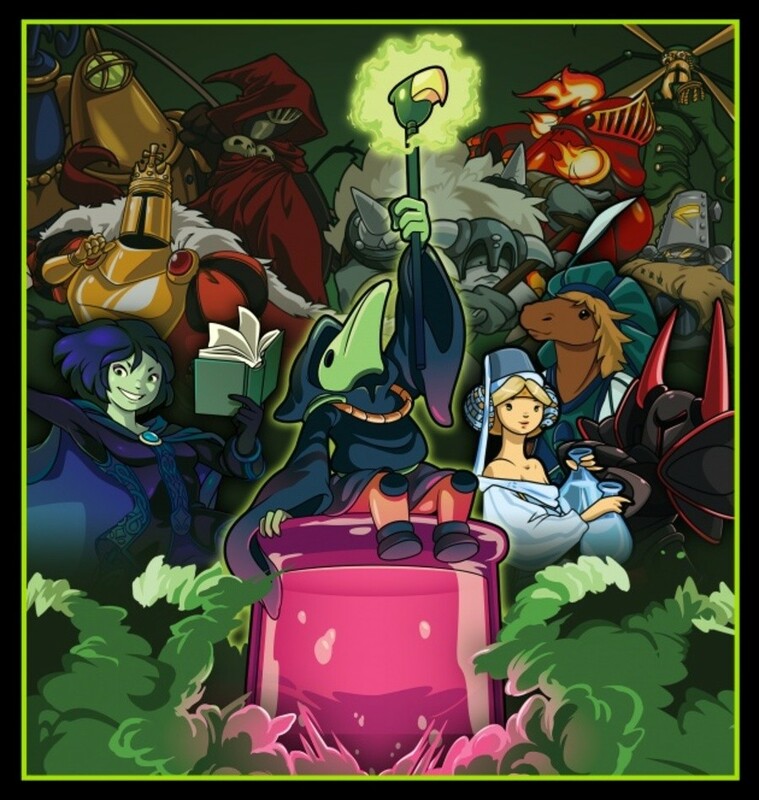 Rest assured, the story is entertaining throughout the lengthy campaign and also does an excellent job of fleshing out Plague Knight more as a character. Gameplay is the same - generally speaking - but Plague Knight possesses a completely different moveset and the stages have all been redesigned around this. You'll still be fighting the same enemies, hunting for treasure chests and visiting the same locations; yet everything has been switched up this time around with a whole slew of new collectibles, secrets, and power-ups to keep things interesting and mostly prevent you from feeling déjà vu. One major takeaway is that this campaign seems to be more difficult than the original, as Plague Knight's chaotic abilities - such as the triple jump - open the door to some devilishly difficult platforming challenges. Make no mistake, you will die a lot. The switch from Shovel Knight to Plague Knight affects more than just the character you play as, with several new game mechanics nearly seamlessly replacing others. For one, Plague Knight's health bar is significantly smaller than Shovel Knight's, but it can be boosted by drinking consumable health potions that have a catch. Each one adds one more cell to your health bar, but if you fall in battle you lose all the cells that were added by drinking them. This adds an excellent layer of strategy to stages, as the player must decide when to best use their limited supply of potions to give the health bar a bit of a boost. Another interesting switch up is the new equipment system that's been employed. Plague Knight primarily fights by tossing lots of volatile bomb potions and there's plenty of scope for customising the perfect bomb that suits your play style best. Players can spend coins back at the lab to buy new fuses, casings and powders that affect when the bomb explodes, how the bomb is tossed, and what explosion results. Different bombs are useful in different situations, leading to a combat system that feels a little more in depth than the original campaign. Plague Knight also has his own system of alchemy themed relics called Arcana, which can be obtained rather humorously by selling off the "worthless" relics that can be found in chests around each stage. Also included in this major update, beyond the Plague of Shadows campaign, are fiendishly difficulty Challenges, just for those that want to put their skills to the test. Adopting a range of scenarios and settings, these may be beyond the skill-set of some but are a welcome addition nevertheless. The soundtrack is comprised of a mixture of old, new, and remixed tracks, and it's an excellent follow up to the original. It really does an excellent job of capturing the spirit of the 8-bit era and there's wonderful range to the mood and tempo of the tracks. Some tracks are upbeat, some are atmospheric, and it seems that there's a subtle sense of mischief behind it all to match the personality of the villainous protagonist. Overall, Shovel Knight: Plague of Shadows, provides an experience that's easily equal to, if not better than, the original game that it remixes. The perfect marriage of old and new provides a distinct experience that manages to stand well enough as its own entity; this is more than just a reskin with a new character. Smart level design, tight controls and a lengthy campaign filled with secrets and collectibles all combine to form an excellent and surprisingly meaty addition to what was an already awesome game. I'm quite enjoying this free update. Here is a tip if you want the "Hang Time" achievement go to the water stage and just keep jumping and burstin in place. This really is an amazing addition. I hope king and specter knight can live up to this. To be honest, I can't really warm up to the expansion. I already disliked Shovel Knight for being too short and easy for how little replayability it offers, but Plague of Shadows is almost a bizarre reverse-case. The content while not really much larger, offers much more character interaction, and by extent, a lot of nice development, subtle and insignificant as it may be. Plague Knight is very quickly established as a crazy, overconfident loudmouth, and almost comes off as an outsider among the Order. Mona gets just what I hoped for: a twisted, but very likeable personality with a bit of hidden depth added later on, and some folks from the village also get new, interesting roles. In addition to that, there's tons of detailed animation in the hidden laboratory, and just as much attention to detail basically in every new area. So the looks are not just retained, but expanded, almost like an indirect sequel. However, the gameplay is... weird, to put it simply. Plague Knight is much more technical than Shovel Knight, and he controls like wet soap. Bad combination. He has this momentum-based moveset that does everything it can to feel unintuitive, with the blast jump especially being difficult to prepare without forcing yourself to stop completely, only to then propel you at unprecedented speeds and with close to no air control. Add to that Plague Knights general lack of out-of-the-box mobility, and fast bosses like Propeller Knight become a chore to fight, while heavily pattern-reliant bosses like Specter Knight become even more of a joke than they were with Shovel Knight. 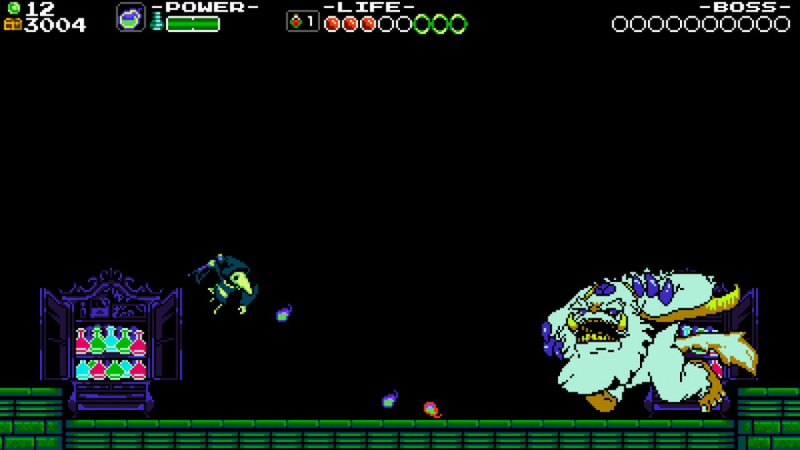 Also, while parts of the main stages got new areas and revisions to cater towards Plague Knight a bit better, some parts are just unfitting for his moveset, nonetheless (like the Underground Ruins, which require a lot of precision, something that is exteemely difficult to achieve with tiny bombs). Overall, Plague of Shadows does some things better, but then goes ahead and ruins itself in other parts. The rise in difficulty often stems from a lack of control, and in other parts it simply doesn't feel fair due to low mobility/speed, but when the level and enemy design actually fits in well, it's still very easy to do. But really, I can't say I'm enjoying it all that much. The new areas (especially the Secret Laboratory) look just awesome, the slightly stronger character focus makes the present cast more interesting, and the nods to previous events are really funny. However, Plague Knight doesn't control very well, and the levels are the exact same for the most part, and thus come off as even more boring since I've played through them numerous times already. I just finished it, and it was such an amazing experience. I thought I played Shovel Knight well... I was so wrong. Controlling Plague Knight was a pain in the you-know-where. It took me so long to get used to it, and once you have learned a new move, you will learn a new one, so basically you can get used to the control fully once you end the game for the first time. I'm trying to reach all the feats now, and it's not going to be an easy ride. Finish a level without getting hurt seems impossible by now. I'm trully amazed at how good this game is. I enjoyed Shovel Knight a lot, and I don't agree that it has little replayability. If this is any sign of how the next campaings will be with King and Spectre Knights, I'm beyond excited. Yacht Club Games can do no wrong, can't wait to see the future of this company. @Kaze_Memaryu I have to agree with you, Plague knights controls are not exactly bad but pretty close to it. Shovel knights play way better. Plague knight controlling not so well and the levels being the same for the most part dont really make me feel like playing through the entire game again. Oh well, hopefully the next character is a little better and some more mew stages are added. "The switch from Shovel Knight to Plague Knight ***effects*** more than just the character you play as, with several new game mechanics nearly seamlessly replacing others." Your opinion is great! His controls are a bit different, and definitely not the same feel as SK, which could turn a few off. And it is some of the same content, so some might also be a little less inclined to jump in as viciously. But, the context worth mentioning, is that it is Free. And DLC - that came as a Kickstarter bonus. That's pretty cool. They could have just made the character model different, they could have added no story or new modes, (Multiplayer on WiiU) and all of this on 4 systems, and that would have been pretty acceptable by today's semi-low standards. However, they didn't. The new modes are quite hard for new players and fun challenge to those who mastered the original and wanted more. @Clamango Actually a bit of a grey area here - "The switch to Plague Knight effects several mechanics being replaced with new ones" would be proper grammar, and you could argue that "The switch to Plague Knight effects the character you play as" is too. Effect can be a verb (Affect can also be a noun, though that's a bit rarer). @OriginalSpiff Yeah, I feel kinda bad for not keeping in mind that they put some great effort into an expansion for no extra charge, so there's that. But at the same time, I don't think the problems would actually be worse if it cost money, so I decided to not mention it. @Zach777 Dude, there's a difference between not being able to control something properly and the game not allowing you to assume control at critical instances (most notably, his burst jump). You can always try to shut me off by baselessly claiming I was bad at the game, that doesn't automatically mean you're right. And in this case, you're definitely not, since I'm already done with Plague Knight's campaign, with only a few coins missing. Also, at what point does Kickstarter have anything to do with any of this, except for Shovel Knight being one of many fundraised games? Is that the new way of saying "make a better game"? Cause that's not even an argument - some things you don't need to be great at to understand what can cause issues. still waiting for someone to do a cipher coin guide. i can't stand having 29/30 coins in both the iron whale and the lost city. @Kze_Memaryu: I find that getting the burst upgrades first is a must. The floating one is invaluable to most of the jumps in the game. Then again I do agree that Plague Knight is very awkward to control compared to Shovel Knight. I'll agree it is awkward playing as pk. It does take some getting used to but im having fun with this new campaign regardless. Best 14.99 investment I made in awhile. I like it even if some dont. Here's to hoping they can actually make king knight and spectre knights campaigns just as interesting. It may be a retired but a solid one nonetheless. Kudos yacht club! "Overall, Shovel Knight: Plague of Shadows, provides an experience that's easily equal to, if not better than, the original game that it remixes." Well, if that's the case then that's just genuinely brilliant. Yacht Club Games is probably the developer I have the most respect for in this generation. How do you play this version? I tried starting a new file but I can still only play as SK. It's brilliant, plague knight's controls take some getting used to but when mastered it's so much more rewarding than shovel knight. The sense of humour of the game shines through brilliantly and the dialogue in parts had me in stitches. Still takes me back to my NES days so the nostalgia element is top notch as usual. I have no problems with Plague Knight's controls. I do die a lot but I don't blame the game for that. Controlling Plague Knight may not be easy to learn at first but once I did I felt really satisfied. @ZachBeacon You will have to finish the game as Shovel Knight before you can play it as Plague Knight. There is a code for unlocking Shovel Knight though but I'd recommed you play it as SK first. @PokemonJustin I got that achievement in the secret room. I just finished this DLC last night. What an excellent addition, could have easily been priced DLC if it hadn't already been promised as a kickstarter reward. I definitely like and respect Plague Knight as a character a lot more now. @LztheQuack Yeah, I noticed that, as well. It still takes some foresight and practice to not shoot Plague Knight right into a hazard, but it's more manageable with the float. I tried it last night, and it's really fun! I just CANNOT WAIT for the Spectre Knight campaign! Anyone have any guesses as to when that may come out? @Giygas_95 This one took about a year, so I'd guess the next expansion should take just as long. @MitchVogel I hope it doesn't take another year! Spectre Knight is my favorite knight! Although I kind of wish Polar Knight had made the cut too, but I'm more than satisfied we got Spectre. Thanks for the in-depth write-up, @MitchVogel! A great read, and it definitely makes me want to dive into this new chapter!